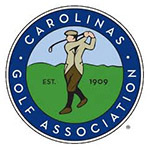 HOLLY SPRINGS, N.C. (Sept. 30, 2018) -- Dustin Moore of Burlington, N.C., and two-time North Carolina Mid-Am Champion Greg Earnhardt of Greensboro, N.C., shot a final-round 67 to capture the 23rd North Carolina Four-Ball Championship hosted by the Club at 12 Oaks in Holly Springs, N.C.
"We really just played solid," Earnhardt said. "If he was out of one or two of them, then I helped and if I was out of one or two of them, he helped. We just tried to hit in the fairway; hit it on the green. We got too much in to par mode for awhile but it worked out." The duo started the day tied for the lead with Clay Watkins of Mebane, N.C., and Stephen Lavenets of Apex, N.C., but found themselves one shot back after a birdie on the second hole by Watkins and Lavenets. After a chip-in birdie on the ninth hole by 13-year-old Tommy Morrison of Pinehurst, N.C., he and teammate Scott Lincicome, also of Pinehurst, N.C., found themselves in a three-way tie for the lead as they made the turn. The tie at the top didn't last long. With birdies on Nos. 6, 7 and 9, Earnhardt and Moore captured the solo lead and never gave it away. The team of Chris Cassetta of High Point, N.C., and John Major of Winston-Salem, N.C., fought hard to keep up with the leaders. The pair birdied the 16th and 17th holes and found themselves on the 18th tee with an outside shot to win the championship. A par by the pair gave Moore and Earnhardt a two-shot cushion heading into the final hole. The champs didn't sleep on the lead. Moore put his approach shot within 5 feet and dropped in the birdie to cruise to a three-shot victory. "It feels great," Moore said. "I've played in a bunch of these the last few years and to come out here and play with those younger guys and have (Earnhardt) on my back. I was hitting first all day and knowing he had my back on every shot, it feels good to win this one that's for sure." Open to any male amateur golfer 13 or older. Must be a resident of North Carolina and a member of a CGA member club. Format is 54 holes of four-ball stroke play with a cut to the low 30 scores and ties.